Summer baking is not really such a common endeavour. In a season full of barbecues, ice creams and fresh salads, our ovens can feel quite lonely. So, it’s time to give your oven some summer loving! Just open the kitchen windows really wide, and let a summery breeze cool down the inside of your house while baking – or bake in the evenings, when it’s cooler anyway. This cake is a proper summer cake. It’s got the zingy-ness of lemons, it’s very buttery but at the same time it’s really light because it’s mostly relying on ground almonds for texture. It’s also incredibly moist! 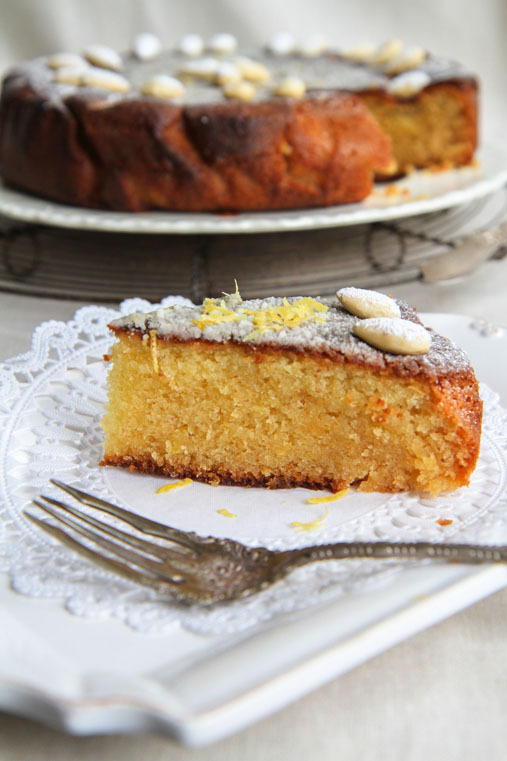 Like a sponge, it soaks up the lemon juice that you drizzle over when it comes out of the oven and is still warm. As for bakeware: best is to use a springform for this cake, since the cake is so moist that when you attempt to flip it over it may break. A springform will let you unmold it without damaging the lovely sponge cake. I really love this cake and I hope you do too. It’s the perfect sweet treat to take to a summer picnic, and goes marvellously well with some fresh fruit on the side. Take a 20cm round cake tin, preferably a springform, and put it onto a sheet of baking paper. With a pencil, draw a line around the springform’s edges and cut out the circular baking paper. Put the round baking paper at the bottom of your cake tin. This will form your base and will make sure that the cake doesn’t stick (alternatively you could just butter the bottom of the cake tin, but that’s less reliable). Butter the edges of the cake tin. Beat the butter and the sugar until light and fluffy, add the eggs one at a time. In a separate bowl, mix the flour, polenta, ground almonds, baking powder with a pinch of salt. Add to the butter egg mix and incorporate well. Add the honey and lemon zest and mix until you have a smooth mixture. Transfer the cake batter into the cake tin and bake for 1 hour. If you’re using the almonds as decoration, take the cake out after 15 minutes and briefly place the almonds in a pattern on top, then continue baking for 45 minutes (like this, you prevent the almonds from sinking, since the cake has already firmed up a bit). You may have to bake it slightly longer, your cake is done when a skewer inserted in the centre comes out clean. Take the cake out of the oven and drizzle with the lemon juice. The cake will immediately absorb this lemon juice, and it will become even moister. Let the cake cool in its tin – it will be too fragile to take out until it’s cooled down. Once cool, take a thin knife and cut around the edges of the cake to loosen it. Open the springform and take the cake out of its tin. 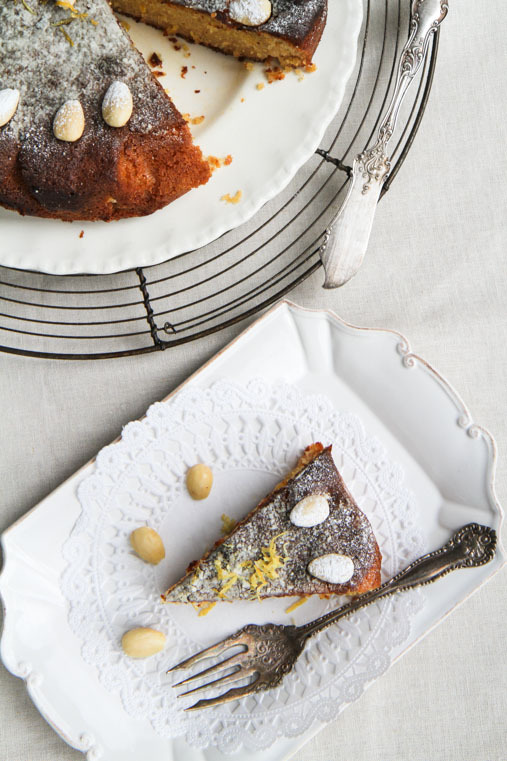 Dust the cake with icing sugar and serve with whipped cream, a fruit salad or Greek yoghurt. 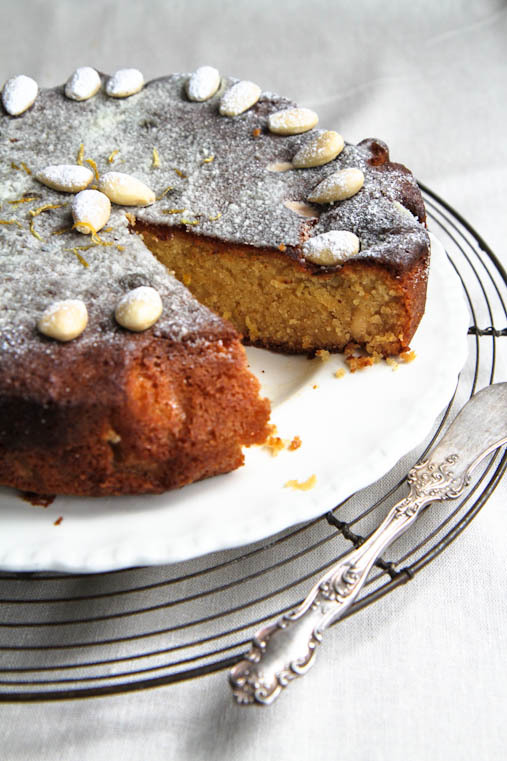 This looks like a great fresh, moist and sweet summer evening cake!